Responsible for coordinating responses to natural disasters, technological emergencies and severe weather emergencies in Atlantic County. To become a CERT member you must be at least 18 years of age and possess a valid driver’s license. If you want to volunteer your services and become trained to protect yourself and families from disasters; natural or man-made… Become a CERT member Today! (609) 407-6764 to (609) 407-6743 or Email: volunteer@readyatlantic.org. Community Emergency Response Teams or CERT, is a concept developed in 1985 by the Los Angeles Fire Department. They recognized that citizens would very likely be on their own during the early stages of a catastrophic disaster. Accordingly, the LAFD decided that some basic training in disaster survival and rescue skills would improve the ability of citizens to survive until emergency personnel could arrive. 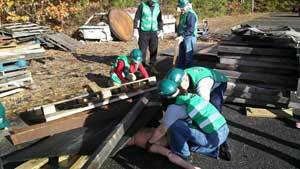 Thus, CERT teams were created to provide vital services in the absence of emergency responders. Today, more than 38 states and several foreign countries have instituted the CERT system. The events of September 11 will never be forgotten; also not forgotten is how the spirit of America was awakened that day and citizens came forth to volunteer their services. President George W. Bush harnessed this spirit of volunteerism with the Citizen Corps program. 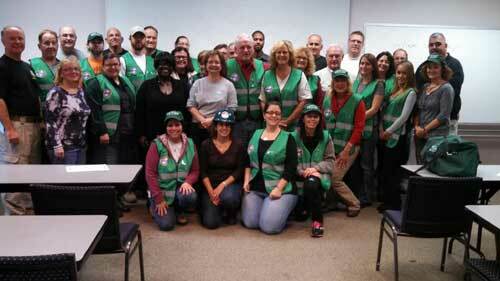 CERT is a part of the Citizen Corps Program. 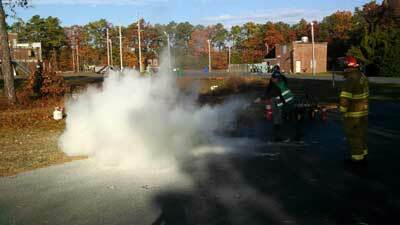 The CERT training consists of a minimum of 20 hours of instruction. Classes are taught by emergency responders, including firefighters, emergency medical and law enforcement personnel from your community. Introduction to disasters specific to the community, and the impact of disaster on infrastructure. Treatment strategies for life-threatening conditions and principles of triage. Head-to-toe patient assessment and treatment for various injuries. Techniques for sizing up and searching, lifting, cribbing and removing victims; rescue safety. The post disaster emotional environment will be discussed. CERT organization, decision making and documentation. A brief overview of terrorism weapons. Identifying targets in an area and discuss time/distance/shielding. Disaster Simulation realistic to your community. Describe the types of hazards most likely to affect their homes and communities. Describe the function of CERT and their roles in immediate response. Take steps to prepare themselves for disaster. Identify and reduce potential fire hazards in their homes and workplaces. Work as a team to apply basic fire suppression strategies, resources, and safety measures to extinguish a burning liquid. Apply techniques for opening airways, controlling bleeding, and treating shock. Conduct triage under simulated conditions. Select and set up a treatment area. Employ basic treatments for various wounds. Identify planning and size-up requirements for potential search and rescue situations. Describe the most common techniques for searching a structure. Use safe techniques for debris removal and victim extrication. Describe ways to protect rescuers during search and rescue. Information obtained from Federal Emergency Management Agency & New Jersey State Police Office of Emergency Management.